Registration for the Youth Basketball League starts this month? This month’s tot rock concert features the delayed appearance of vintage swing-noir specialists Erin Brazill & the Brazillionaires. Brazill was forced to cancel her September show, but come Saturday, Nov. 16 from 10 a.m. to noon her cabaret-singer voice will grace the Upper Noe stage. The band’s eclectic, original music is a varying combination of jazz, pop, Americana and more, played on instruments ranging from drums and guitar to washboard and glockenspiel. Hear clips of the music and see pictures of the band here. Saturday tot concerts at Upper Noe are free, thanks to Friends of Noe Valley Recreation Center. They are held on the playground in fair weather or inside the center’s auditorium if it’s too cold or wet. Our music curator Richard Hildreth will likely take December and January off, but 2014 will have plenty more tot concerts, so stay tuned. Registration for Junior Warriors basketball starts Saturday, Nov. 9, at 10 a.m., and Upper Noe will host two teams to play in this city-wide co-ed league, run by the Recreation and Park Department. Kindergarteners ages 4 to 6 practice will Wednesdays at 4 p.m., followed by first and second graders ages 6 to 8 practicing from 5 to 6 p.m. The season runs from the week of January 6 to March 15. Register in person at St. Mary’s Recreation Center at Murray Street and Justin Drive or online at www.sfreconline.org. To register online at www.sfreconline.org you must have a Family Account. Click here to create a Family Account. Existing teams can also join the league for games only by calling Cortez Espinoza at 415-695-5006. Nacera Mekki teaches yoga at Upper Noe, but she has also long been a student: she spent 200 hours learning how to teach yoga from renowned local instructor Les Leventhal. She holds Bachelor's degrees in biology and psychology. She is learning how to incorporate yoga into physical therapy by assisting a therapist. Despite all this studying, Mekki is committed to down-to-earth teaching that makes yoga relevant in life outside the studio, too. The mat is a sort of mirror, she said. Holding a difficult pose might bring up all kinds of emotions, including frustration with the teacher: Why is she holding the pose for so long?! Over time, that pause happens off the mat as well. Class is not rigid, though. Mekki has fun with music, and uses it to set the pace of the poses. On Halloween, that pace included a yoga-pose dance to Michael Jackson’s Thriller. Mekki teaches private lessons, in yoga studios and at two Rec and Park classes, including Tuesdays at Upper Noe from 6:30 to 7:30 p.m.
Drop-in fee costs $10, or you can pay $42 for the whole term. Registration for winter classes starts Saturday, Dec. 14, at 10 a.m., and catalogs should be available online around Nov. 21 and in paper by the last week of November, says Facility Coordinator Cheryl Woltjen. 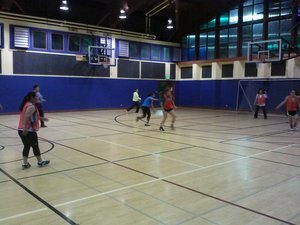 Drop-in women’s futsal happens Friday nights from 6:30 to 8:30 p.m., and there is room for more to join. “The pace is fast---they’re getting a good workout,” said Facility Coordinator Cheryl Woltjen. About eight women from their 20s to their 40s show up for the scrimmages, she said. The cost is $5. Upper Noe’s drop-in volleyball on Wednesday nights is for intermediate and advanced players. Want to learn? The Recreation and Parks Department offers classes for beginners at Sunset (women), St. Mary’s (men) and Eureka recreation centers. Please see www.sfreconline.com for details. The Saturday morning boot class needs students. Boot camp combines brisk running with outdoor strengthening challenges in a park cross-training adventure. Register online at www.sfreconline.org or in person at the rec center. It's a Dog's Life, So Live It Up! Companions party in Joby's Run. 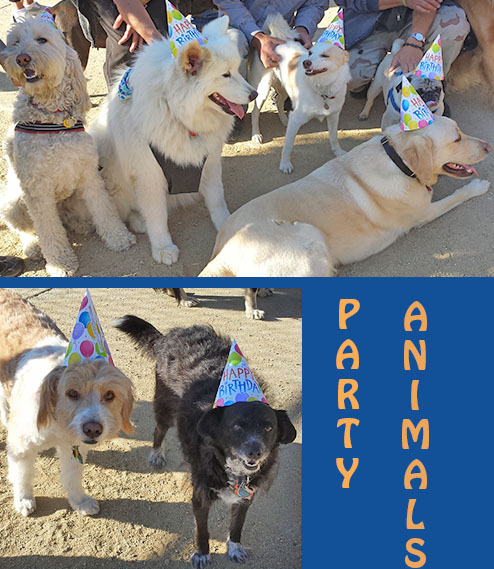 There's always reason to celebrate at Upper Noe with good friends and great neighbors. Sasha (2nd from left at top) wanted more trees for her birthday. Will her wish come true? Wanted: Witty, hardworking, supportive community member with a flare for journalism, dedication to the neighborhood and local park, and a great sense of humor. Friends of Noe Valley Recreation Center needs someone to write the monthly newsletter, to submit the latest center schedule to the neighborhood newspaper and to maintain the FNVRC website. The job takes less than 10 hours a month. Interested? Please contact info@noevalleyreccenter.com. • Garden at the Park. Help keep the park beautiful by volunteering with the Ladybug Gardeners on the second Saturday of each quarter. The last date in 2013 is December 14. All ages welcome, no experience necessary, community service hours credited. Even an hour would be a big help! Please contact us at info (at) noevalleyreccenter.com. Get the little ones swinging to the cabaret vocals and Americana instruments of Erin Brazill and the Brazillionaires. Help determine programming priorities at Upper Noe. Help decide the new design of Noe Courts, the neighborhood pocket park at 24th and Douglass streets.